The Elstertalbahn railway runs in the heart of the beautiful Vogtland region, passing through Thuringia, Saxony and Bohemia in the Czech Republic. The line with its 30 train stations and stops can look back on 140 years of railway tradition. It offers passengers a fantastic natural setting along the Weisse Elster river, with attractive tourist destinations at all times of the year. Along the route, there are several certified hiking and biking trails. In addition, cities worth a visit include Gera, the residential city of Greiz, Plauen known as the city of lace, or Oelsnitz known for its carpet manufacturing. Adorf is the gate to Upper Vogtland; and Cheb is a town in Egerland, a historic region in Bohemia. Furthermore, you can visit the tradition-rich health spas of Bad Elster, Bad Brambach or Franzensbad. Famous sights along the railway route include the lower Palace in Greiz, the Elster Viaduct (Elstertalbrücke), and the over 225-year-old timber bridge in Wünschendorf with the 1,000-year-old St. Vitus Church. A few other great places to mention are Pirk Dam, Voigtsberg Castle in Oelsnitz, the King Albert Theatre (König Albert Theater) in Bad Elster, or Cheb Castle in Eger. The romantic valley of the Weisse Elster river is ideal for extended walks, hikes or cycling tours. In the former border strip between countless hills, pristine nature and rare flora and fauna have been preserved. The Weisse Elster in the Elstertal valley is a diverse river with strong currents. This natural paradise is perfect for a relaxing getaway. The heritage of the farmers and bailiffs boasts remarkable historic buildings and traditional crafts, with numerous places in Vogtland being listed. On the way to its mouth into the Saale river, the Weisse Elster shapes eastern Thuringia as well as south-western Saxony. Nestled between meadows and forests, the Elstertal valley is the perfect territory for hikers and cyclists. The certified Vogtland Panorama Weg® trail and the Elsterperlenweg® trail accompany the river. Besides, a section of the 400-km-long Thüringenweg trail leads through the lovely food plain of the Weisse Elster river with its typical hill forests. The marketing of the existing Gera–Cheb railway line is part of the EU Programme called Peripheral Access. With the aid of this Interreg project, the railway line shall be marketed in a more targeted approach. Up to May 2020, the railway line with 30 stations, which is attractive to tourists, is being studied and analysed in detail. A cross-border marketing campaign for the EgroNet transport system will be developed with partners and those in charge of the railway. The special purpose association expects an increase in travellers and those who will visit the region as tourists. The EgroNet – use only one ticket for all 700 means of transport in four regions! Here, you can obtain the fastest overview of how to get comfortably and economically to the next cultural highlight, weekend trip or hiking and cycling tour within the EgroNet region with only one ticket. The European border region called Euregio Egrensis; including Bavaria, Bohemia, Saxony and Thuringia; is conveniently and economically interconnected by the EgroNet – a cross-regional local public transport system. 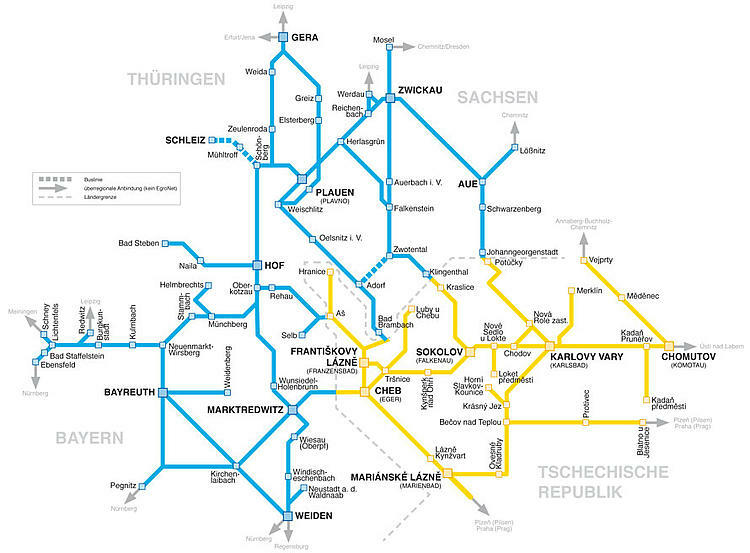 The cross-border mobility system (Mobilitätssystem 464) offers travellers an elaborate network of regional bus lines, 187 city bus and tram lines and 42 railway routes with over 7,300 stops. Within the EgroNet area, you can change from train to bus or tramway as often as you like by buying just one ticket: the EgroNet ticket.